In the wake of the 1917 Revolution, when the Soviet Union replaced Tsarist Russia, both the US and Britain wanted regime change. Three months before WW I ended, Britain led a multi-nation force against Soviet Russia. At the time, Lloyd George was Prime Minister. Churchill was UK Minister of War and Air. Woodrow Wilson was US president. Thousands of US marines were involved. They invaded Russia, intervening against Bolshevik forces, remaining until April 1920, an early example of imperial American lawlessness. On the one hand, Soviet Russia and today’s Russian Federation land mass represents a huge prize, rich in valued resources, America perhaps willing to go to war for control. 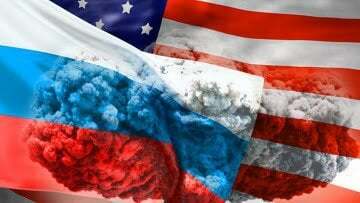 advancing politically and economically at America’s expense, a slow, steady process under Putin’s stewardship, one nation rising, the other declining, some observers believe significantly in the post-9/11 era, a process begun years earlier. America’s rage for power is delusional, showing it failed to learn the lesson of past empires, gone on the rocks of their hubris and arrogance, the eventual fate for the self-styled “indispensable nation,” increasingly seen more as a liability than asset in the eyes of growing numbers of nations, wanting peace, stability and prosperity, not endless wars of conquest, one nation after another systematically destroyed. America has interests, not allies, using nation states to serve its imperial agenda, mainly Pentagon controlled NATO, Israel and rogue Arab states, an alliance for endless wars of conquest, mass slaughter and destruction, countries systematically ravaged, their resources stolen, their people exploited. Major flashpoint areas risk igniting global thermonuclear war – Ukraine, Syria, and other Middle East areas where US/Russian interests clash. Washington transformed Ukraine into a Nazi-infested fascist dictatorship – used as a dagger targeting Russia’s heartland, along with other Eastern countries close to its border, pressured to play America’s dirty game, no matter the harm to their interests. Preserving Syrian sovereignty is key to preventing Iran’s isolation, and the entire region becoming a US/Israeli colony, partnered with Saudi tyrants and the Erdogan-led international criminal organization running Turkey. Riyadh and Ankara are ruthless rogue states, threatening regional peace, stability and security. They’re creating a so-called “strategic cooperation council,” focusing on military, political and economic issues. Saudi Foreign Minister Adel al-Jubeir announced the scheme, omitting explanation of the imperial aims of both nations – saying things were arranged this week during discussions between Erdogan and Saudi King Salman in Riyadh – meeting for the third time this year, united against Syria’s Assad. Wanting him ousted is consistent with US objectives, using these and other countries as instruments of anti-Russian policies, wanting its sovereign independence destroyed, risking possible thermonuclear confrontation to achieve its maniacal aims – a clear agenda of madness. In a letter to the world body, Syria’s UN envoy Bashar al-Ja’afari accused Erdogan of high crimes against the Syrian Arab Republic – covertly supporting ISIS and other terrorist groups, warning of his delusional goal to “revive” the Ottoman Empire. “Since 2011, an unprecedented terrorist war has been waged against the Syrian Arab Republic by armed terrorist groups, the members of which come from more than 100 countries,” Ja’afari explained. Those groups are being provided with funding, weapons, materiel and logistical support by states and regimes from the region and beyond. Erdogan continues committing heinous high crimes – with full support and encouragement from Washington. Russia’s anti-terrorism intervention foiled his northern Syria no-fly zone/safe haven scheme. His designs on Mosul, Iraq oil fields remain, Baghdad committed to liberate the area from ISIS control and get world support against Turkish forces operating illegally cross-border. Ja’afari’s call for the UN “to take a firm stand (to) put end to (Ankara) violations and crimes falls on deaf ears with Washington calling the shots. Its Security Council veto power lets it continue pursuing its regional agenda without official world body condemnation. At the same time, Russia’s intervention changed things dramatically. Syrian forces continue making slow, steady gains, ISIS and other terrorist groups very much on the back foot. Defeating them is another issue, no simple task as long as US and other outside support continue. They control Iraqi and Libyan territory, infiltrated into Central Asia, have safe havens outside Syrian territory, new recruits apparently keep coming, and their revenue sources keep supplying millions of dollars daily.